Are you guys ready for spring? I begrudgingly am. I only say begrudgingly because, while I am ready for it to be warmer and am pretty sick of driving to work in blizzards, this was a great winter for me in terms of cross country skiing, and snowshoeing a lot. I still may try to squeeze in one more ski this week if the weather cooperates. Anyhow, it is starting to get warmer, the days are getting longer, and the snow is pretty much gone from everywhere but the mountains up in NEPA where I call home, and it’s time to start thinking about those spring/summer plans. For the past couple of years, one of the first nice weather activities I seemed to always do was take a drive from Lancaster out to Marsh Creek State Park and go paddle boarding, something I would then typically repeat 2 or 3 times a summer. 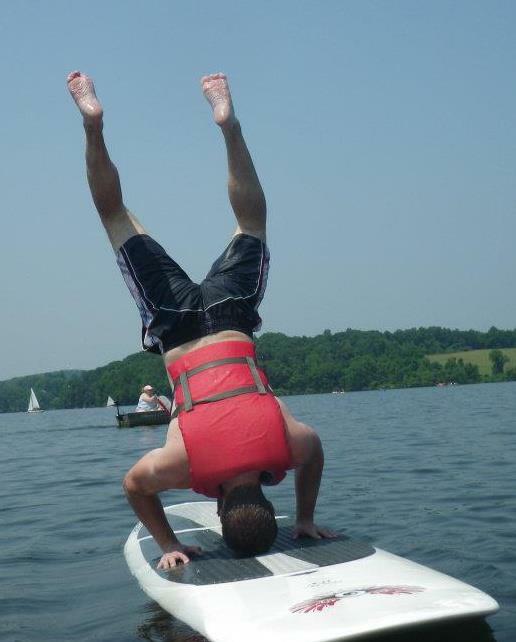 Attempting some SUP tricks over Memorial Day weekend a few years ago. Immediately after this was snapped, I smacked my back on the board pretty good. I was just thinking about this the other day, and got a bit bummed since this won’t be an option for me this year, however, after doing some quick online research realized that there’s actually some paddle boarding choices up here in NEPA, and that in fact, there’s quite a bit of options all around the state, so I decided, much like I’ve done in the past with snowshoeing and cross country skiing, to compile them in one central post. Standup paddle boarding (often times abbreviated as simply SUP), which has been around for a long time, has really exploded in popularity the last few years. The simple gist is that you stand on what is essentially a longer/wider surf board and using a single oar, propel yourself across the water. I like SUP because it’s a great way to be on the water, it’s an awesome core workout, and it’s a good group activity as it’s much easier to stay balanced then one might think. An even newer revelations is SUP workout classes and yoga, which I’ve never attended, but am curious to try. So, without further ado, here are some places to SUP around PA.
Marsh Creek is where I first learned to paddle board. Just an aside, while plenty of the places give lessons, I don’t think you really need them (unless you’re doing whitewater, which we’ll touch upon momentarily). At Marsh Creek, they asked us whether or not we’d ever been on one, and then gave us a quick tutorial of how to paddle and stand up-it took 5 minutes and was all the tutorial I really needed (and I’m not a particularly fast learner). Marsh Creek offers SUP rentals and also does fitness classes on Saturday mornings, that I always meant to try, but then my hangovers would inevitably get in the way. The Crank, a bicycle and paddle sports store located outside of Reading has boards for sale and rent and also does group paddles at Blue Marsh Lake. I was surprised to find places to SUP in Philadelphia, not because the area has a shortage of waterways, but more because I don’t know why one would subject themselves to possibly falling into either the Delaware or Schuylkill (I feel the same way whenever I see pictures of people SUPing on the Hudson-don’t they watch Law & Order: SVU marathons-that’s always where the bodies are!). Anyhow, Paddle Groove runs rentals near boathouse row (which would be awesome scenery to paddle under, with the skyline and art museum in the background-I would risk falling into the Schuylkill I think for this). They also have teamed up with Aqua Vida SUP to offer yoga classes on the Delaware River. Valley to Summit is an outdoor adventure company located in Philadelphia, and while I couldn’t find any specific SUP info, they do offer trips (and actually, their SUP page said to check back soon for the 2015 schedule). Driftwood Adventures in Levittown does rentals, yoga, and even some night paddles. If you just wish to rent and find your own water supply (which is easy) Pelican Stores in Quakertown does daily rentals. There’s quite a few places to rent SUP along the Susquehanna River. Susquehanna Outfitters is located right in Harrisburg and rents SUP’s right from City Island-they also do longer trips with shuttles if you’re so inclined. Blue Mountain Outfitters is located up the river in Marysville (one of those places I’ve never been, but feel familiar with because I always see signs for it), and also includes rentals, as well as guided trips. Finally, Shank’s Mare, which is located in York County, also does rentals for the lower Susquehanna. There’s a ton of places to SUP out in Pittsburgh and western PA, probably because the rivers are such an integral part of the city. Before we get to paddling in and around downtown Pittsburgh, I want to mention that Wilderness Voyageurs, operating out of Ohiopyle, does SUP rentals, as well as a full day class on how to SUP in light whitewater, that I’d really like to attend. Beaver Board Shop, located about an hour’s north of Pittsburgh does rentals on the Beaver River (and is located within close proximity to a tiki bar). Stand Up Pittsburgh has a full store devoted to SUP in Ambridge PA, and does rentals as well. Northeast Paddle Board Co. has a shop in Pittsburgh, as wells a McKeesport, and does rentals (including multi-day for people wanting to go out of town), and a Sunday Funday live music paddle that sounds like a really good time. Surf Sup Adventures has 3 locations and in addition to rentals has guided tours of the downtown region and islands on the Allegheny. Rise-Up Pittsburgh also does rentals and lessons-I rented from here last summer through their joint venture with Kayak Pittsburgh (which in itself is a cool program you should check out). Finally, SUP 3 Rivers offers additional rentals and tours-I think their fitness tour (a 7 mile paddle) looks great. And now we arrive in NEPA. Pocono Action Sports does SUP rentals on Lake Wallenpaupack. Mauka Nalu does tours, fitness classes, and yoga on the Delware River, and Pocono Paddle and Fitness provides tours Lake Harmony, Boulder Lake, and a combined paddle and hike waterfall tour on Beltzville Lake. So, did I miss anywhere? Have you SUPed around PA? Where’s the best spot to go? Has anyone ever gone on the ocean? I was thinking about doing it in Martha’s Vineyard this past summer, but since it’s the filming locale of Jaws and all, I figured I better not. I’m taking my SUP to the Potomac river this summer!